With the release of OS X 10.8, Mountain Lion -- the latest version of OS X -- there are many changes to System Preferences. 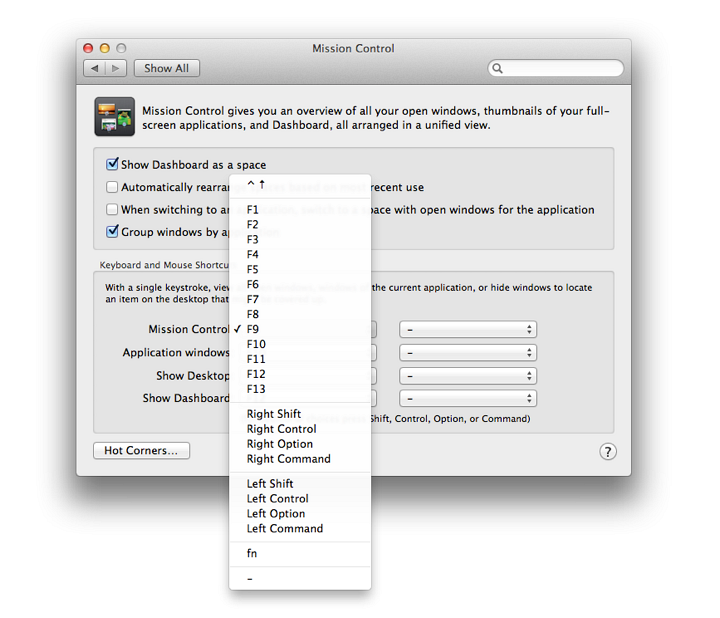 Mission Control preferences has a panel almost identical to the one in OS X 10.7, Lion, but there are some small additions and changes. 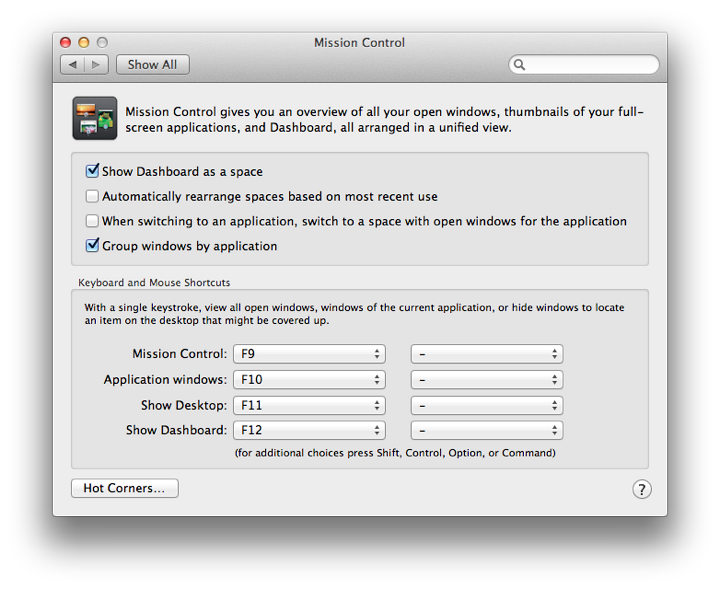 With OS X 10.7, Lion, Exposé & Spaces was replaced by a new, trimmed down feature: Mission Control. This is displayed in System Preferences with a single panel, in two sections. At the top we have checkboxes for Mission Control. At the bottom are Keyboard and Mouse shortcuts, with a button for Hot Corners at bottom left. Show Dashboard as a space. When Mission Control is used, a thumbnail display of Dashboard is shown alongside the thumbnails of any desktops. When deselected, to access Dashboard the F12 key is used (by default). Automatically rearrange spaces based on most recent use. This can be used in conjunction with the Dock menu which allows a user to specify a space for an application (see Notes). When switching to an application, switch to a space with open windows for the application. Show Dashboard: default key is F12 (fn + F12). The desktop is moved to the right and the user has access to the Dashboard and any Widgets installed. When clicked, each button in the first column reveals a list of keys which may be used to reallocate the command. For example, instead of the default F9 for Mission Control, we may choose Right Shift. This re-allocation takes affect immediately. We may also add to these commands by pressing Shift, Control, Option and/or Command keys as we allocate the keys. For example, with Show Dashboard, we may press the Command button to change the key display and press the mouse (or trackpad) to accept the change. Pressing the Command key and clicking again, removes the additional key from the combination. Alongside the key commands is a second column of buttons. These are initially unallocated and a dash is shown. Users may choose to have one or more of the above features activated by pressing a mouse click. On my installation I may choose only Secondary Mouse Button or Middle Mouse Button. If any of the control keys (Shift, Control, Option, Command) is pressed -- alone or in combination -- these also appear in the menu. They are accepted (or removed) by clicking the mouse or the trackpad. A specific action may be allocated to each of the four corners of the screen. As the cursor moves to the corner, an action is carried out. Options available are Mission Control, Application Windows, Desktop, Dashboard, Notification Center (new), Launchpad, Start Screensaver, Disable Screensaver, Put Display to Sleep and - (no action). Mission Control manages spaces. On new installations there is a single space (plus Dashboard) and the number of spaces should increase as more applications are opened. On some Macs that I installed Mountain Lion on, there were 6 spaces before (in Snow Leopard and Lion) and the same number with Mountain Lion. If Spaces was not used before, a default single space is available. New spaces can be added when Mission Control is being used -- click the icon in the Dock -- by moving the cursor towards the top right of the screen. A new, semi-transparent space appears. By clicking in that new space, it becomes a new space and is allocated a consecutive number (e.g. Desktop 7). This then also appears in Key Commands. To remove a space, slide the cursor towards the space display when Mission Control is being used. An X will appear at the top left of the space thumbnail. Clicking on this removes the space. When an application icon is shown in the Dock (open or not), click on the icon and use the Options menu to Assign the application to "All Spaces" or "This Space" or "None". 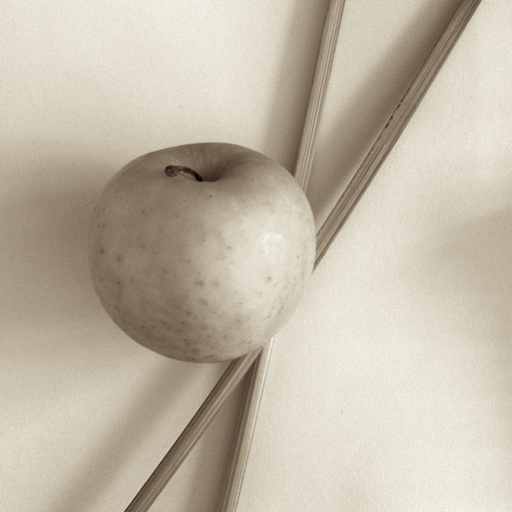 The last is available when the application has already been assigned to a specific space. As pointed out to me in an email from Greg of Imaja Software another useful feature is that when Mission Control is used to view all open windows, the miniature views of the application panels can be enlarged by moving the cursor over the specific pane and pressing the space bar (as in Quick View).